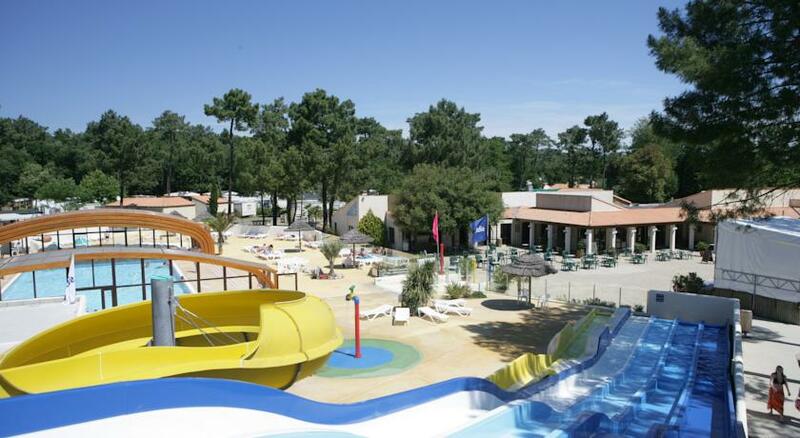 Only 1.5 km from Ronce-les-Bains with its beaches, La Pignade offers self-catering mobile homes in a green, countryside setting. An outdoor swimming pool with water-slide, a tennis court and billiard facilities feature on site. The mobile homes have access to a covered terrace or an outside seating area with sun loungers and parasol. All include a bathroom with shower and a kitchen, equipped with a microwave, stove and fridge. Bread and pastries can be bought on site, and the on-site restaurant is open for lunch and dinner during low season. Barbecue facilities are also at guests’ disposal, and local supermarkets are within the immediate vicinity. A horse-riding centre features at La Pignade, and bikes are available for rent. The property runs 3 free children’s clubs for younger guests, and free, private parking is possible on site with no prior reservation. Posizione del luogo "Campeggio La Pignade"